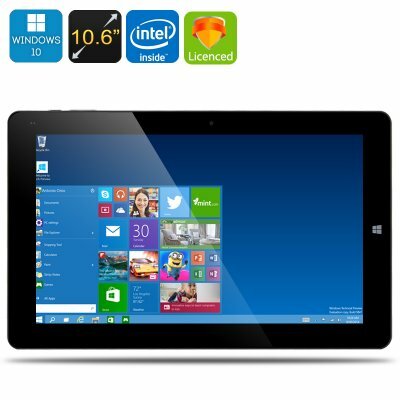 Successfully Added Chuwi Vi10 Ultimate Tablet PC - Licensed Windows 10 OS, Intel Cherry Trail CPU, 2GB RAM, 64GB Memory, USB 3.0, OTG to your Shopping Cart. The Chuwi Vi10 Ultimate Tablet PC has an Atom X5 Z8300 Cherry trail processor that uses 14nm architecture for an enhanced performance at 1.84GHz, when combined with the 2GB of DDR 3 RAM you get plenty of power for games and movies. Coming with 64GB of eMMC there's loads of storage space and the lush 10.6 inch IPS screen provides more than enough room for enjoying movies in crisp 1366x768 resolutions, so all your media and games are shown in perfect high definition. Thanks to 10 point touch support you can make the most of gaming and that eighth generation Intel HD graphics comes to its own once you enter the gaming arena as it can keep up with even the most demanding tablet games. This tablet truly shines with its 3D games support that brings you a marvelous gaming system when you're on the go. This Chuwi Vi10 Ultimate tablet boasts advanced connectivity with 2 full size USB ports, one of which supports USB 3.0 for high speed data, there is also a micro USB port and OTG that brings support for mobile hard disc drives if you require extra storage on top of the 64GB built in memory and micro SD card slot. A magnetized docking port allows you to add the Chuwi keyboard (not included), and this lets you turn the tablet PC into a duly fledged Windows 10 laptop, there is even an HDMI port so you can connect to the big screen when working from home or making presentations. Taking advantage of the efficient 14nm architecture the 8000mAh battery on this tablet brings you plenty of usage time and can easily play your block buster movies with about 3 hours of video running time. Front and rear cameras make it easy to conference call, while the licensed version of Windows 10 brings all the productivity tools you could need. If you're looking for a light yet powerful alternative to a laptop but with the ease and portability of a tablet PC then the Chuwi Vi10 Ultimate is a winning contender, it comes with a 12 months warranty and is brought to you by the leader in electronic devices as well as wholesale tablet PCs..